This is my second entry to LP22, see also my other entry Special Lugaw, Pinoy Special Congeeposted last December 18. Included on this post is Overseas Pinoy Cooking 2007 Year End Round Up. Happy New Year to All! Lasang Pinoy 22 Rice to the Challenge, what does it mean? All the while I though I will just have to cook something out of rice as the main ingredient, write something about it and publish it anytime during the event period which is the month of December. After analyzing what it really meant I realized that there was something that is a must to it. It is not just cook, write and publish thing, It’s a challenge to cook rice food that is never tried, a novelty, unique or new at least to myself. LP22 theme Rice to the challenge is very relevant at this time of the year. Filipinos are celebrating two very important occasions, Christmas and New Year, this is the time when most Pinoys are cooking and preparing rice foods for the holiday season celebration. Since my childhood, in my food memories, rice foods like suman, bibingka, paella valenciana, puto, ect. are synonym of Christmas and New Year. Paella valencianna is a traditional regular dish on our New Year media-noche meal at home, I have been cooking it when ever I am lucky to be at home during past Christmases and New Years. This year I am not that fortunate, I have celebrated my Christmas here in Abu Dhabi together with my colleagues and also this coming New Year’s eve. Last Christmas I just made a simple buko fruit salad, so simple and easy to prepare, I only used canned fruits including the buko meat. See previous post on Buko Fruit Salad. 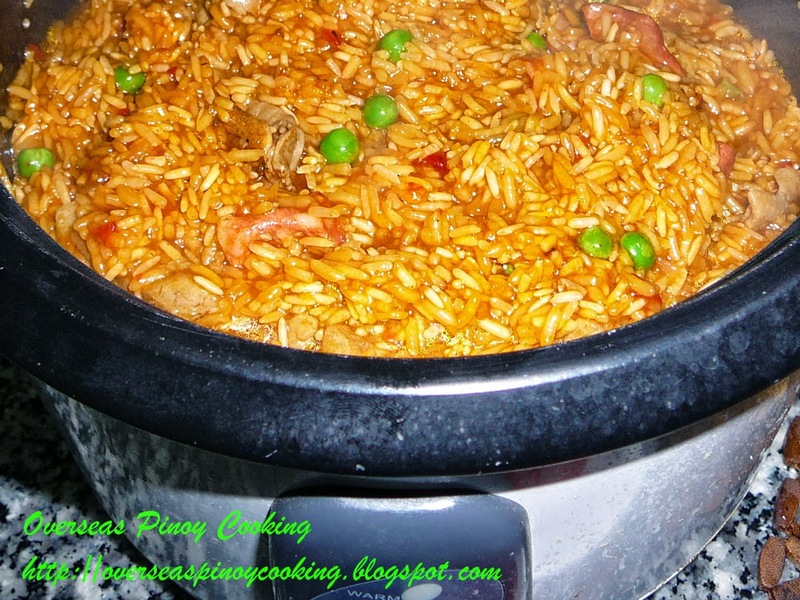 The LP22 challenge, my second entry to LP22 is to cook a simple seafood paella valencianna dish made out of ready to cook frozen seafood and would you believe using a rice cooker. I named it Pinoy seafood paella valencianna. The idea came from the recipe book that usually come along with Panasonic Rice Cooker called Rice Cooker Recipe. Seafood paella valencianna is an extravagant dish for the reason that it requires a lot of fresh seafood ingredients which at times resulted cooking more than enough paella for every one. 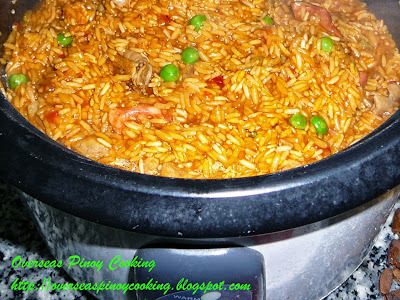 Now I would like to share on how I cook these simple, economic and equally delicious paella using rice cooker. Cut pork and chicken into serving pieces. Rub chicken and pork with a dash of paprika salt and pepper and let stand for 10 to 15 minutes. In a wok heat oil, brown chicken and pork on all side, set aside. Fry chorizo until it start to sizzle, set aside. 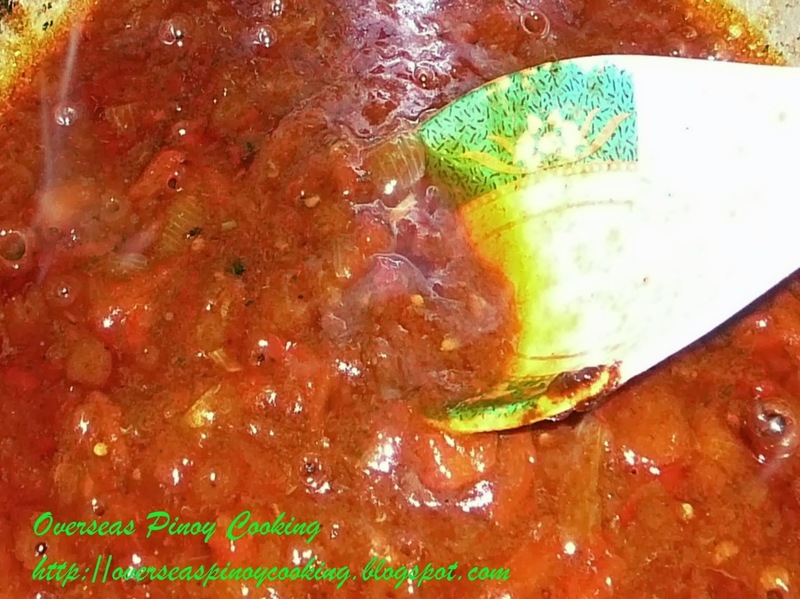 Sauté garlic and onion, add tomato sauce, roasted bell pepper and 1/2 c. water, add salt and pepper to taste, stir cook until most of the liquid has evaporated and turn into an oily thick sauce. Add 1 cup water let boil, add rice, saffron and remaining paprika, stir until rice is coated and infused with the sauce and tinted with bright orange. Add pork, chicken and chorizo, stir cook for another 2 to 3 minutes. Transfer rice to rice cooker, add enough water. Cook until button pop up. Now stir in green peas and seafood cocktail on the half cooked rice. Place on top tahong, prawns, crab stick and bell pepper. Cover and leaving the rice to finish cooking in the steam for 10 to 15 minutes. 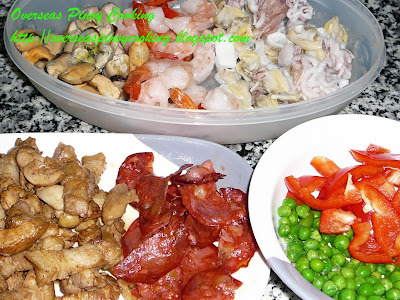 Transfer paella in a platter arrange meat and seafood on top, garnish with wedges of itlog na maalat or hard boiled eggs. 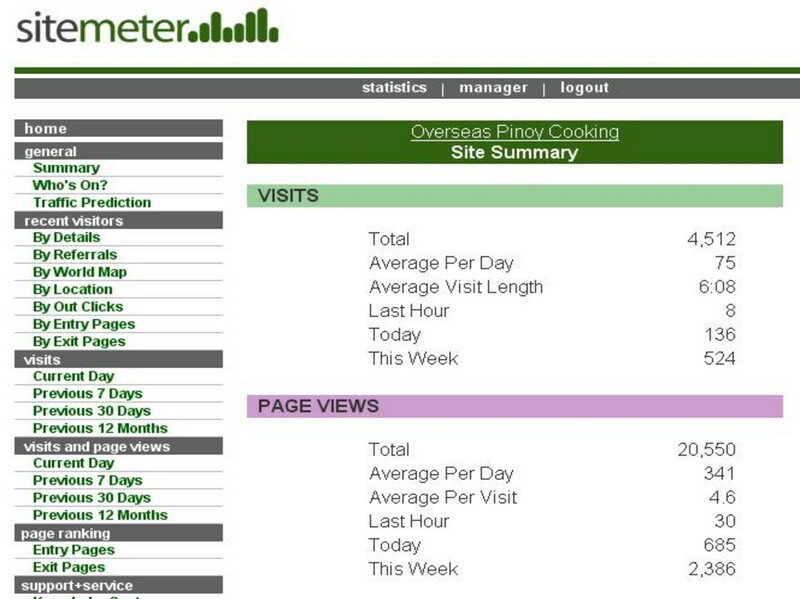 Overseas Pinoy Cooking is now on its 6th month and 95 post entries. Out of those post entry I have shared about 100 recipes, 99 recipes on my last count, 3 entries to the Lasang Pinoy Monthly food blogging event and 1 food feature entry. Wow I never thought I could write all those recipe. Site visit statistics is also more than good enough, to this date there are about 4,500 visits recorded, the average site visitor has grewn to about 75 to 80 visitors a day. 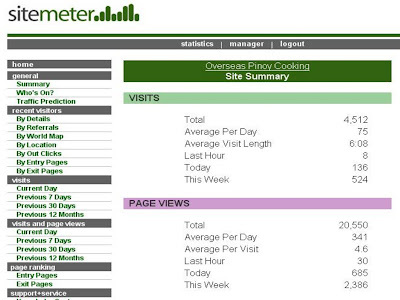 On several occasions visits have surpassed the 100 daily visitor mark. on Dec. 30, 2007 at 2330hrs. Of course my recipes and write-ups were not always perfect I am not a professional cook or a writer. I admit there are some unintentional mistakes on my recipes and grammar mistake on my write-ups. How ever the most important thing is my good intention to share. I am just an OFW who loves cooking and trying to share my kitchen adventures in a way also helping countless other OFW separated from their love ones and struggling to cook for them selves. And in a way help also our kababayans who have chosen to settle on foreign lands for a better life and now have missed so much of our very own Pinoy foods. I would like to thank now all my readers and visitors. To those who just stumbled upon visitors and to my readers who keep coming back, especially those who have left comments. Once again Happy New Year to all! Thanks again for joining LP22! Thanks for joining Lasang Pinoy 22 . . . Hope to see you in the next round! JMom and MikeMina, It was my first try to cook it on rice cooker, it did turn up all right. Happy New Year! great idea to cook in a rice cooker. what a festive-looking dish. especially with all that seafood. sarap. andaming sahog!!! never had the real paella in my life. we'd always have biringhe at home. wonder if i could pull this off when i get to cook better. :) happy new year! 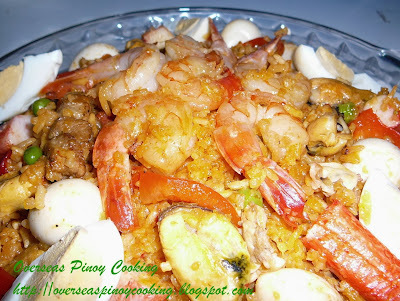 Sa version ito ng paella inihalo ko lang yong mga small pieces na ingredients sa cooking rice, tapos inilagay ko yong mga pre-cooked big shelled ingredients sa ibabaw lang. Otherwise try to soak the rice in water for 10-15 minutes speaialy kong marami na talaga ang lulutoin. Hindi talaga maiiwasan and tutong. last minute search on what to prepare for the new year. I've got paella in mind - a dare, never done this, and I find your process easy to understand and visuals provided are so vivid. Happy new year and i'll surely keep you posted how it turned out! Soak the rice in water for at least 10 to 15 minutes. Cook/sauté a little bit longer on a wok before transferring to the rice cooker.